Homeopathic remedies will help support the person's immune system with the measles. Disneyland Measles Outbreak Caused By Vaccine? The measles is a highly contagious airborne virus which spreads primarily through the respiratory system. The infection is passed by contact with droplets from the nose, mouth, or throat of an infected person. Coughing will place contaminated droplets into the air. Symptoms typically begin 8 - 12 days once you’re exposed to the virus. A measles rash typically starts on the top and spreads to alternative areas, moving down the body. Humans are the only known natural hosts of measles, although the virus can infect some non-human primate species. 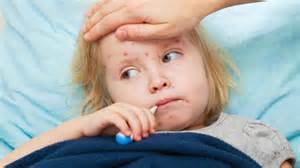 There is no specific treatment or antiviral therapy for uncomplicated measles. Most patients with uncomplicated measles will recover with rest and supportive treatment. 2 - 3 days after symptoms begin, tiny white spots, called "Koplik's spots" may appear inside the mouth. 3 - 5 days after symptoms begin, a rash breaks out. It usually begins as flat red spots that appear on the face at the hairline and spread downward to the neck, trunk, arms, legs, and feet. Small raised bumps may also appear on top of the flat red spots. The spots may become joined together as they spread from the head to the rest of the body. Can be done with confirmation of positive measles IgM antibodies or isolation of measles virus RNA from respiratory specimens. In cases of measles infection following secondary vaccine failure, IgM antibody may not be present. In these cases, blood serum confirmation can be made by showing IgG antibody rises. In children, saliva can be collected for salivary measles specific IgA test. Useful at the beginning stages of measles. High fever. Dry barking cough. "Pink eye" or red conjuncitiva. Skin burns and itches. Restless, anxious, and frightened. Tossing and turning in sleep. The rash begins but fails to develop fully then it soon disappears. Feeling unwell. Skin itching is worse by warmth. The face and eyelids are puffy. Useful at the beginning stages of the measles when there is sudden onset of a high fever, reddened face and throbbing headache. Drowsy or delirious. Trouble falling or staying asleep. Not very thirsty even with fever. The measles skin eruptions are delayed. Hard, dry cough and no expectoration. Any motion causes pain. They may experience some mild delirium the child "wants to go home" even though they are at home. Fever and rash. Acrid tearing of the eyes and a bland nasal discharge. Sensitive to light. Cough but usually only during the day. Onset of symptoms is slow. Fever with great weakness and a sense of heaviness, in the whole body and specifically the eyelids. Muscle aches and pains, like with the flu. Lack of thirst, lethargy, exhaustion. Ropy, stringy discharges from the nose and burning and tearing of the eyes. Their salivary glands are noticeably swollen. They may have stitching pains from the ear into the head and neck. This is the measles nosode and this is given by prescription only and used as a preventative remedy to build the immune system before exposure to measles and during any epidemic as a prevention. It is used in the Homeoprophylaxis Program (HP) under supervision by a certified Homeopath in HP. This is remedy for measles also used for Homeoprophylaxis, to help prevent the measles at the first exposure to measles. Used for a mild case of the measles. Fever is not high and symptoms are not too painful. Profuse tearing from the eyes and a nasal discharge. Dry cough at night which becomes loose in the daytime. May also have ear inflammation. Dry mouth but without thirst. Skin has a purplish appearance. Itching is aggravated by scratching. Reddened mucous membranes and are very thirst. Cough and diarrhea are worse in the morning.